Mona Lisa is one of the world’s most studied paintings, yet she still has secrets to reveal. Join art historian Lee Sandstead—university professor and host of Travel Channel’s Emmy nominated Art Attack—on an interactive journey into the hidden world of Renaissance and realist art. Watch engaging videos. Read interviews with prominent museum conservators. 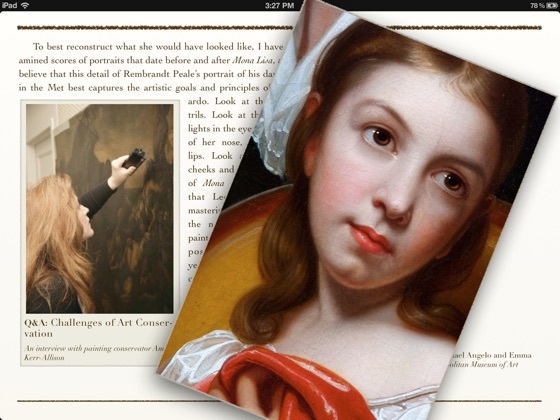 Interact with gorgeous paintings by artists such as Titian, Rembrandt, Waterhouse, and Bouguereau. All to follow Lee on his quest to understand the greatest secret of all—the craft behind the woman. 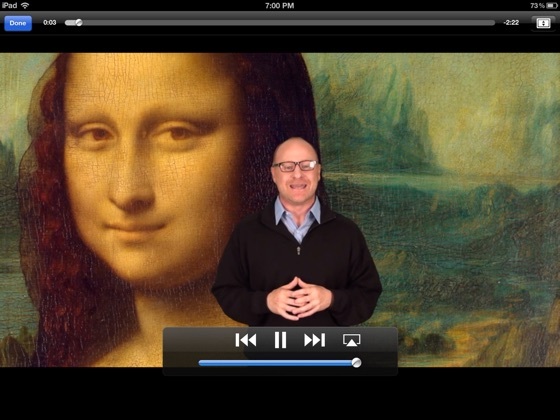 Cleaning Mona Lisa was designed by Tapity, Inc., winner of a 2011 Apple Design Award. 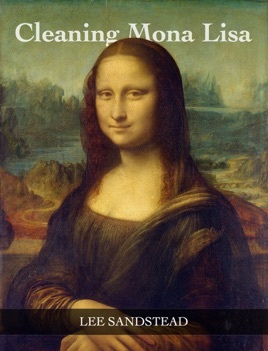 Cleaning Mona Lisa requires iBooks 2.1.1 or later. 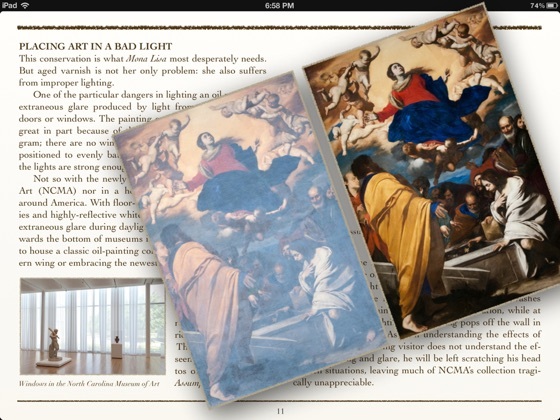 I had the recent pleasure of reading an advance copy of art historian Lee Sandstead's new iBook "Cleaning Mona Lisa. 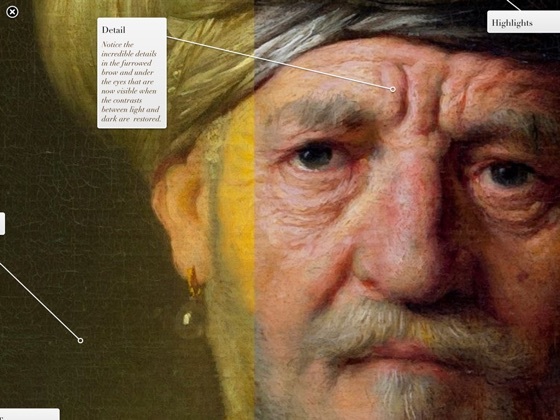 "The best part of Sandstead's book (in addition to its excellent exploitation of the iBook format and stunning photograpic imagery) is how Sandstead systematically overturns an oft-repeated myth in art history—that Leonardo DaVinci painted the Mona Lisa as we see it today, saturated with yellow, no eyebrows on the face, and seeming rubber gloves on the hands (I heard this myth myself when I studied art history in college). Instead of myth, Sandstead delivers a real-world DaVinci Code, showing his readers what the Mona Lisa really means, both to the people of DaVinci's era, and to us today. Don't miss it. As a teacher, I showed this iBook to my students before a museum trip, and in a few minutes time, I projected the book on the classroom's lcd projector. The students were astounded and added greatly to the museum experience. Although it says the iBooks is for upper grades, I showed this to my 5th grade class to great aplumb. I have been teaching art for several years, and I did not know the lessons in this book. For $2.99, this will greatly enhance any museum experience. I am a regular museum-goer, and I had no idea that I was not getting the most out of my museum-going experience. Thanks to Cleaning Mona Lisa; I learned some very important lessons. For instance, I never thought of the negative effects of extranneous glare in museums, and Lee Sandstead has painstakenly documented many painting that are lit corrrectly versus not lit correctly. This is invaluable to me. If you are the person who stands in front of art scratching your head--then this is for you. If you are a person who wants to get even more out of museum-going experience, this book is for you. If you are an educator, then this book is for you. I just had no idea that learning to appreciate art--is an art in and of itself! Thank you Lee Sandstead.